We are really excited about our new partnership with Mode-sty! There are many different reasons women want modest clothing. Women in the work force are looking for clothing that is professional. Connoisseurs of high fashion often desire clothing with more coverage to emulate couture runway looks. Many of us are self conscious about parts of our bodies and don’t feel comfortable showing too much leg, arm and cleavage. There are numerous different Faiths in our world; in lots of ways we are more alike than different. Many Faiths teach the importance of modesty and consequentially there are countless women who have made commitments to dress modestly. What “modesty” means to each women and to each Faith may be different but one thing I think we can all agree on is that it is getting increasing difficult to find current & stylish clothing with the coverage we desire. At Illume we value women. We have a deeply rooted belief that each woman is of eternal worth. We value modesty. 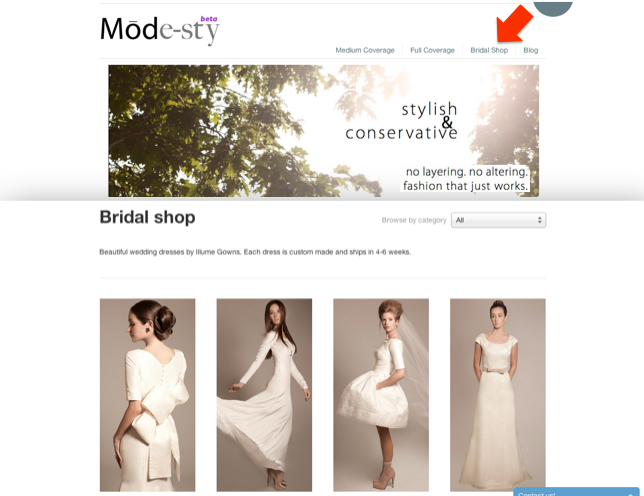 We are excited to be partnering with Mode-sty an online shop that sells modest & stylish dresses. They work hard to bring you stylish, quality, modest dresses all in one spot! They just added a bridal shop to their website. We are honored to be the first bridal collection featured! You can also follow them on Facebook, Instagram @stylishmodesty and their blog.